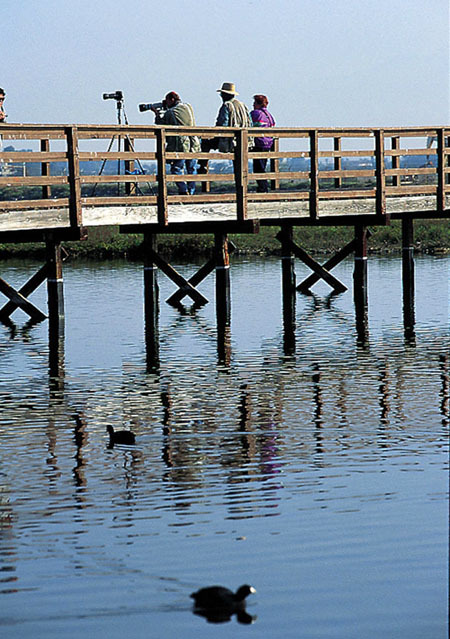 Considered one of the prime birding areas in Southern California, this home to a huge variety of plant, bird and animal species is open free to the public. Free tours are also offered the first Saturday of each month from 9-10:30 a.m.
Sunset Beach provides ample space for recreational activities. Traditional water related activities such as swimming, body and board surfing are common. A surfing zone is provided and controlled by the "black ball" flag system. Lifeguard service is provided. Food and beach supplies are available at many nearby stores, restaurants and food stands. To reach the parking facility beach goers should take Warner Avenue, 5th Street, Broadway or Anderson Street off of The Coast Highway. There are 5 marinas within the Sunset-Huntington harbor area. Near Sunset-Huntington Harbor is the Anaheim Bay National Wildlife Refuge which is home to numerous types of marine life and birds that thrive in the natural habitat; and is said to be one of the most important and beautiful natural wildlife area along the Pacific Coast.